From its establishment in 1945, Leaktite Corporation has achieved solid growth based on experience and flexibility to move with the times. Our reputation has been built on quality, service, and our ability to serve the needs of our customers and the marketplace. We support our product development with state-of-the-art injection mold and thermoforming production equipment in order to ensure maximum efficiency and also to meet the ever-changing needs of our customers. Our products are used in a wide variety of industrial, commercial and consumer-product applications. We have a broad background in standard and unique applications, and our decorating machinery is capable of offset printing for up to five colors on special applications. We are constantly making improvements to our product lines to incorporate features and benefits that make Leaktite products the best and most trusted products in the market. Our vision for the future is one that requires total involvement at all levels in order to be a valuable partner to our customers. 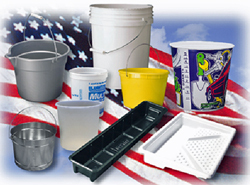 Leaktite products are proudly made in America and are 100% guaranteed.